When I think of supporting all users, I think not only in terms of individual users, but also in terms of serving institutions as users. 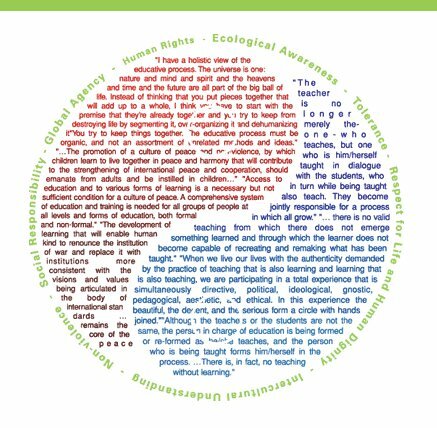 In my role, I often ask myself how can my work become central to the work of an educational agency? How can my resources be mainstreamed into the culture and practice of a school or district? My questions arise because the online educational learning space is crowded and cluttered and noisy. And, it is becoming more impacted every day as a vigorous market is being created. A recent study from IBIS Capital, a London-based investment bank, shows that the e-learning market is the fastest growing education market at $4 trillion dollars in 2012, with $91 billion of that marked for e-learning. See larger rendition of graphic, provided by IBIS Capital. In this high-paced, resource-rich and noisy market, with so many voices clamoring for my user’s attention, how can my voice be the one that catches their ear? How can they hear me above the din? I don’t like to scream to be heard. “What keeps you up at night?” asks Michael Stephens of participants in library conferences. Although this question is used to break the ice and encourage sharing among participants, the answer he receives is revealing but not surprising. Relevancy. Concerns about losing relevancy is what keeps librarians up at night. Maintaining relevancy, within the reality captured in the graphic, above, is what can keep me up at night, too. Whether operating in a global, regional, or local environment – understanding user needs and providing flexible services, supported by organizational adaptability, are key to ensuring relevancy. It is this type of understanding that will also keep our services user-focused and human, rather than simply building services that are more and more layers on a technological onion with a severe bite. But, how can we best understand our users’ needs? I’m a true believer in action research, of asking questions and learning together. Action research is based on certain values, including the need for justice and democracy, the right of people to be heard, the right of each individual to improve their work and, to me personally, the deep need to experience truth and beauty in professional, as well as personal, life (McNiff, 2002). Action research is a natural companion and partner to the hyperlinked library because action research does not apply a one-for-all answer to all organizations; rather, it recognizes the situationally-based needs of organizations. Our conversations together in the hyperlinked library can utilize action-based research methods to better understand our users ‘situations’ and needs, as well as for building our action steps and relevant services. Action research shifts from the prescription of rules of operation derived from external studies, to the situationally-based examination of questions around individual and organizational practice, followed by the collaborative generation of ‘action’ principles to apply to each specific and defined question. Action research practice provides a mechanism for building individual and organization capacity for adaptive change (Senge, 2006) and the creation of relevant services envisioned in the hyperlinked library. These principles apply whether we are moving in robust markets driven by financial gain, or in remote local information centers. There simply is no such thing as a one-size-fits-all technology or information system, regardless of the domain in which we operate. The agendas and technologies of the scope and scale pictured on the graph above simply do not allow for the types of questions and answers we need to ask in our hyperlinked library. The hyperlinked library provides a situationally-focused lens for individual and organizational reflection, and for the subsequent creation and adaptation of services that will ensure relevancy. The hyperlinked library we envision is an enabling environment, recognizing and releasing human creativity and imagination for building adaptive and relevant practice and services to all users. Senge, P. (2006). The fifth discipline. New York, NY: Random House. Stephens, M. (2013). Things That Go “Bump”.